signalEditor function — Signal Editor starts from the command line. From the Root Inport Mapper — To create a MAT-file for your new signal data, select Signals > New MAT-File. To link in an existing signal data file from an existing scenario and edit the signals in that file, use the Signals > Edit MAT-File. Signal Editor works only with MAT-files. Create and edit multiple signals in multiple data sets. Use signal notations to create more complicated signals using MATLAB® expressions. 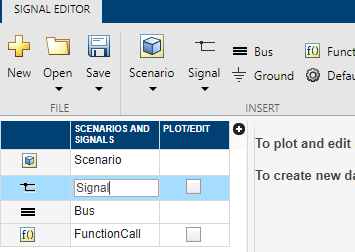 Use existing scenarios to get existing data sets for which you can edit and create signals. Create and edit multidimensional signals. Use tabular editing or MATLAB to modify signal data. Modify signal properties such as name, interpolation, and unit properties. Drag and drop signals to change signal hierarchies for buses and data sets. Use signal notations and variables to replace signal data. Alternatively, you can import data from external sources and edit them in Signal Editor. For more information, see Link in Signal Data from Signal Builder Block and Simulink Design Verifier Environment. FILE section Save and Sync and SAVE commands save and synchronize to the Root Inport Mapper. Insert section Scenario command always has the option, Scenario from Model. If you start the function with a model name, the signalEditor function Signal Editor user interface shows the option Scenario from Model in the Insert section. 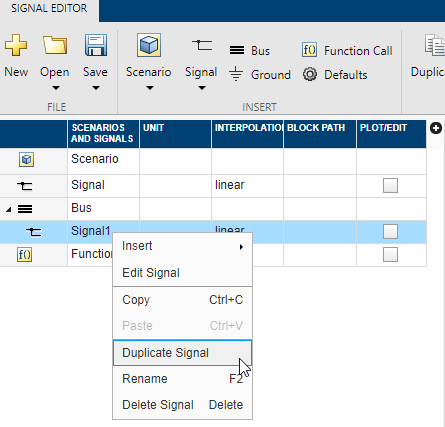 The Signal Editor user interface supports all signal data types that Simulink® supports and that are editable. You can use Signals > Edit MAT-File to link in MAT-file data from these sources for editing. Simulink Design Verifier™, see Link in Test Vectors from Simulink Design Verifier Environment. Signal Builder block File > Export Data > To MAT-file option, then link in the MAT-file. For more information on exporting from a Signal Builder block, see Exporting Signal Group Data. You can link in and edit Simulink Design Verifier test vectors. 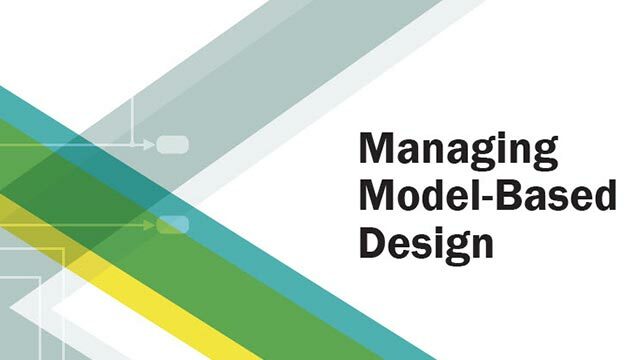 This workflow requires a Simulink Design Verifier license. Before linking in, use the Simulink Design Verifier sldvsimdata function to convert a Simulink Design Verifier test structure to a set of Simulink.SimulationData.Dataset objects. This file contains a test vector structure sldvData. Save the output to a MAT-file and then import that file into Signal Editor. Signal Editor uses scenarios to group and organize sets of inputs to be saved to a MAT-file for a single simulation. 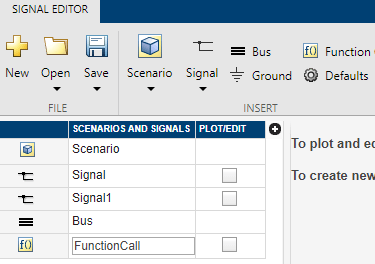 To create signal data using existing data sets from existing scenarios, or create an empty scenario into which to add signals, use the Signal Editor Scenario menu. You can also use the signaleditor function with a model argument. When using this option, the resulting scenario contains signals with the data types and dimensions of the inport ports. 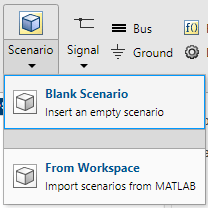 Select Scenario > Blank Scenario. Select Scenario > From Workspace. To begin inserting signals, use the other options in the Insert section. For more information, see Create Signals and Signal Data. To change the signal order in the hierarchy or change the name of a signal, see Change Signal Names and Hierarchy Orders. To insert signals into scenarios, select the scenario, then click a signal type from the Insert section. Blank Signal — Add signal data directly into a table (see Work with Basic Signal Data). Author Signal — Author signal data using signal notations and variables (Create Signals with MATLAB Expressions and Variables). If you need a function-call signal for a root inport with explicit periodic sample time, insert a ground signal instead. Simulink then executes the function-call automatically. The new signals appear in the Scenarios and Signals section. You can also insert multiple signals of the same type. For more information, see Create Signals with the Same Properties. For tabular editing, see Work with Basic Signal Data. To replace the signal data or edit the signal notation using MATLAB expressions, see Replace Signal Data with MATLAB Expressions. Adding signal data directly into a table (Work with Basic Signal Data). 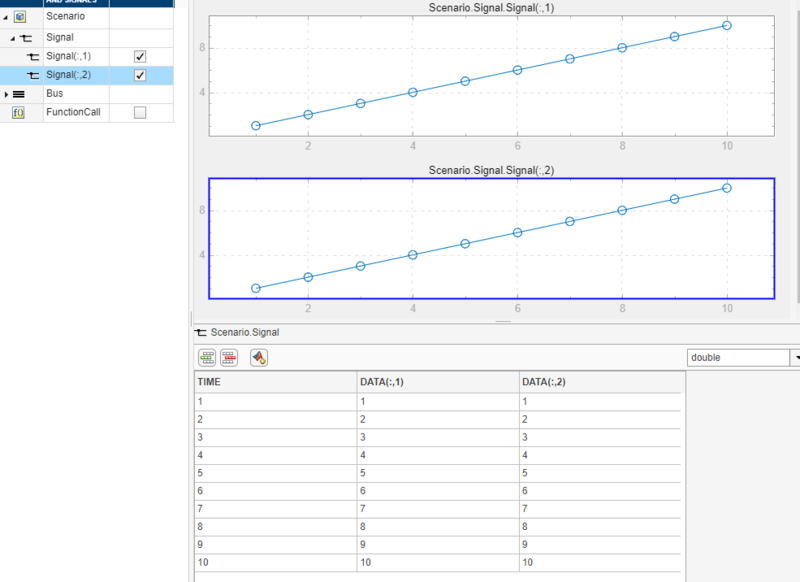 Authoring signal data using signal notations and variables (Create Signals with MATLAB Expressions and Variables). After inserting the signal, view and plot the data by clicking the Plot/Edit check box. If the data does not plot as expected, use the Fit to window button in the Zoom & Pan section. For multidimensional signals, also make sure that you have the right plot selected for the column data you are editing. Explore the plots using the Measure and Zoom & Pan sections on the toolbar. In the Measure section, use the Data Cursors button to display one or two cursors for the plot. These cursors display the T and Y values of a data point in the plot. To view a data point, click a point on the plot line. In the Zoom & Pan section, select how you want to zoom and pan the signal plots. Zooming is only for the selected axis. Zoom in along the T and Y axes. Zoom in along the time axis. After selecting the icon, on the graph, drag the mouse to select an area to enlarge. Zoom in along the data value axis. After selecting the icon, on the graph, drag the mouse to select an area to enlarge. Zoom out from the graph. Fit the plot to the graph. After selecting the icon, click the graph to enlarge the plot to fill the graph. Pan the graph up, down, left, or right. Select the icon. 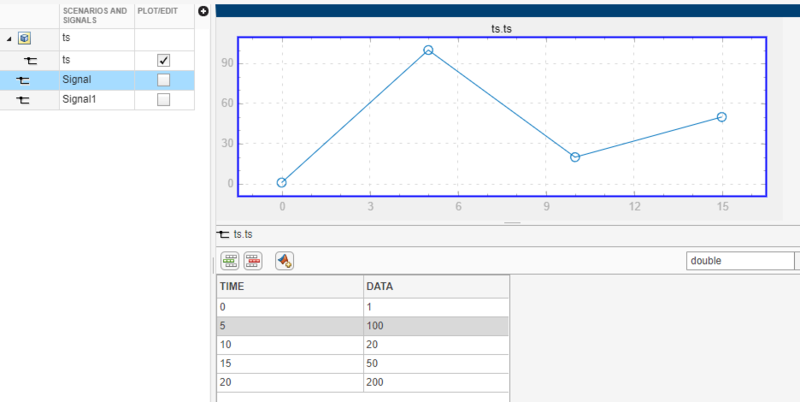 On the graph, hold the left mouse button and move the mouse to the area of the graph that you want to view. To add and edit basic signal data, select a signal and click the associated Plot/Edit check box. A plot of the signal displays. Under the signal plot is a tabular editor. To insert or delete a data row for a signal, use or , respectively. To change the data type for signal data, select the type from the drop-down. You cannot change data types to or from a fixed-point data type. To change the time or data for each signal, edit the associated column of the data row, then click Apply to update the plot of the signal. Ideal Value — Requested value. Fixed-Point Value — Value resulting from casting the ideal value as a fixed-point value. Absolute Error — Absolute error of value. Relative Error — Difference between cast value and the original value. Additional error information, such as whether the error is an overflow or underflow. To change the size of the plot or tabular area, move the separator up and down. To create multidimensional signals, use one of these methods. For more information, see Add and Edit Multidimensional Signals. In the Default Properties for Insertion dialog box, enter a dimension greater than 1 in the Dimensions parameter. Instead of using the tabular editor to define signal data, you can use MATLAB expressions. 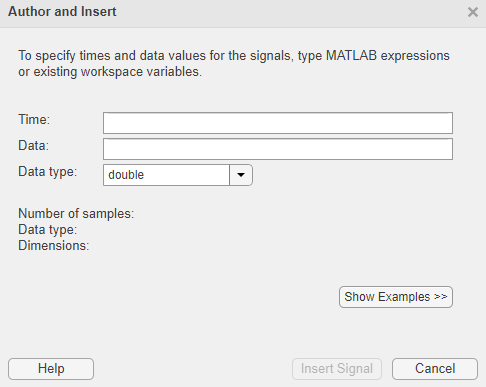 To add signals using MATLAB expressions and variables, select the Signal Editor Signal > Author Signal option. Time — Enter the range of time for the data. 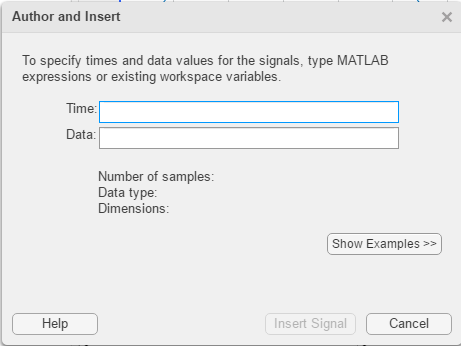 Data — Enter the MATLAB expression for the signal. Data type — Select or enter the signal data type. If you enter your time and data and then select a fixed-point data type, the Signal Editor displays a fixed-point proposed data type for your data. Values The negative, positive, and zero signal values. Potential Overflows Bins the signal values that may overflow. In-Range Bins the signal values that are within acceptable range. Potential Underflows Bins the signal values that may underflow. For more information, see Histogram Plot of Signal (Fixed-Point Designer). To apply the proposed fixed-point data type to your data, click the Use proposed data type button ( ). When you click Insert Signal, the interface evaluates the signal, updates the signal information in the dialog box, and adds the signal to the Scenarios and Signals section. In addition, the number of samples, signal data type, and signal dimension also appear. To see example Time and Data entries, click the Show Examples button. To experiment with the signals from these example signal notations, click the Apply Example button for the associated example. You can also modify the examples before inserting. For example, to create a sine wave, click the Apply Example button next to that example and click the Insert Signal button. Observe that dialog box displays the number of samples, signal data type, and signal dimensions. To view the signal, cancel the Author and Insert dialog box, navigate to the Scenarios and Signals section, and click the Plot/Edit button for the new signal. If a signal has real and imaginary parts, both parts display in one plot. To edit signal data without using MATLAB expressions, see Work with Basic Signal Data. Freehand signal data is data that you add graphically. Signal Editor allows you to add freehand signal data using a mouse or touchscreen (if available and supported). 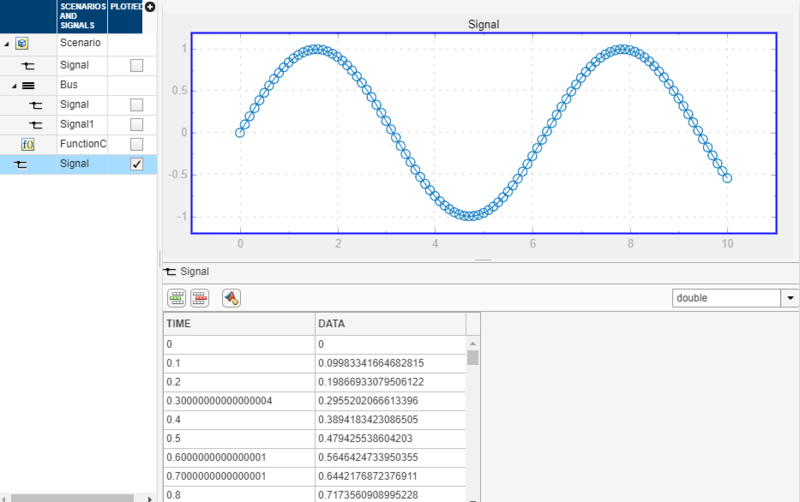 To add freehand signal data , select the Signal Editor Signal > Draw Signal option. A Draw tab opens. 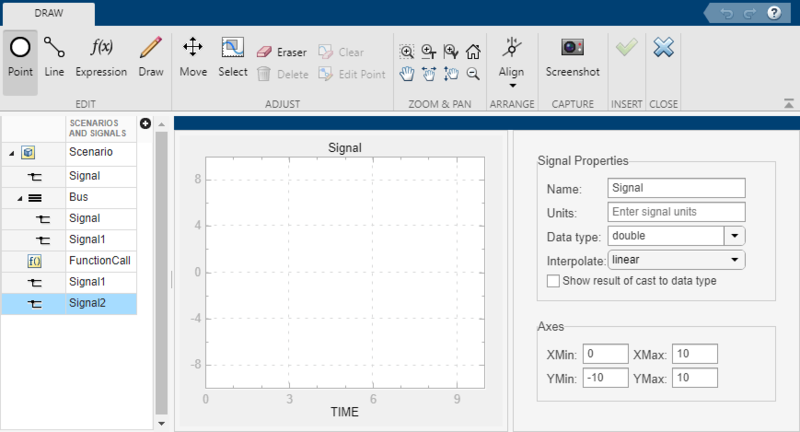 You can draw your own signal lines or points, use MATLAB expression to enter data, move signal lines or points across the canvas, take an image of the lines of the canvas, and add the data to the Signal Editor. Insert a single data point by clicking Insert Point ( , Ctrl+P) and then clicking in the graph area. If you add additional points, the tool connects the points. This action is touchscreen supported. 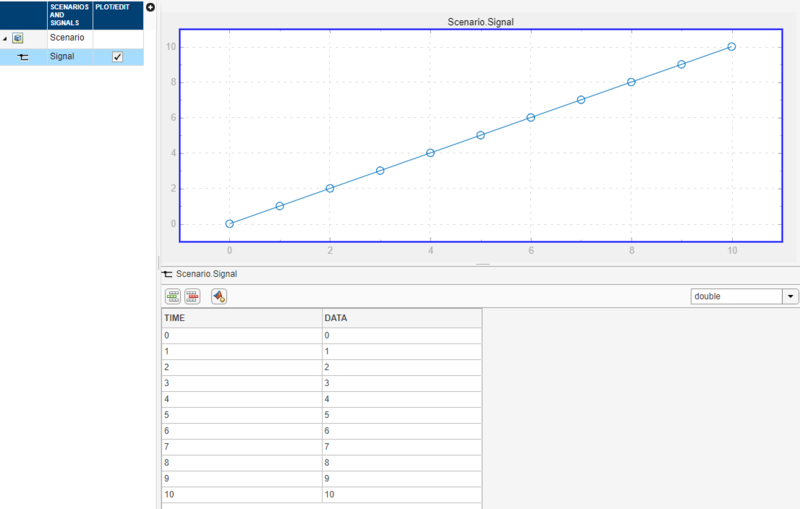 Insert a signal line by clicking Insert Line ( , Ctrl+L) and then clicking in the graph area. To extend the line, click on the endpoints of the line and draw the extension.This action is touchscreen supported. When you insert signals or signal lines, the canvas adds a shaded area bound by the leftmost and rightmost endpoints. While in Insert Line mode, you cannot add more points within this shaded area. You add additional line points outside the shaded area. Draw a signal freehand by clicking Draw (Ctrl+D) and drawing in the canvas. This action is touchscreen supported. Draw a signal using MATLAB expressions by clicking Expression ( , Ctrl+E). Enter time and data values that create signal points that are scalars or vectors whose number of points match the time points. Select a point or line by clicking Select ( , Ctrl+T) and then selecting the point or area to be selected. This action is touchscreen supported. Move a point or line by clicking Move ( , Ctrl+M). This action is touchscreen supported. Change the data of a point by clicking Edit Point ( ). In the Edit Point dialog box, enter the new Time and Data values. These values must be scalar. To work with the canvas, use the tools in the Align, Show, and Zoom sections. Snap the canvas graph to various grids using the tools in the Align section. Snapping to grid helps you better control data accuracy while drawing signals. For example, consider snapping to the x-grid to uniformly sample signal values or snapping to the y-grid to control the amplitude of a ramp signal. Toggle the display of data points, grid lines, and data markers in the canvas, explore the commands in the Align and Show sections. To zoom in and out of the canvas, see Zoom & Pan. These actions are touchscreen supported. For more information, see Create Signals and Signal Data. To work with signal properties, use the parameters in the Signal Properties section. For example, to see the changed values of your signal as you change data types in the Data type parameter, select the Show result of cast to data type. The original line is blue, the changed values are represented by the black line. This graphic illustrates a signal line with negative double values recast as uint8. To capture an image of the signal data, in the Capture section, click Screenshot ( ). In the Save a screenshot dialog box, specify a name and graphic type for the file. To add the signal to the Signal Editor, click Insert signal ( ). To return to the main Signal Editor window and check that the signal has been added, click Close draw tab ( ). 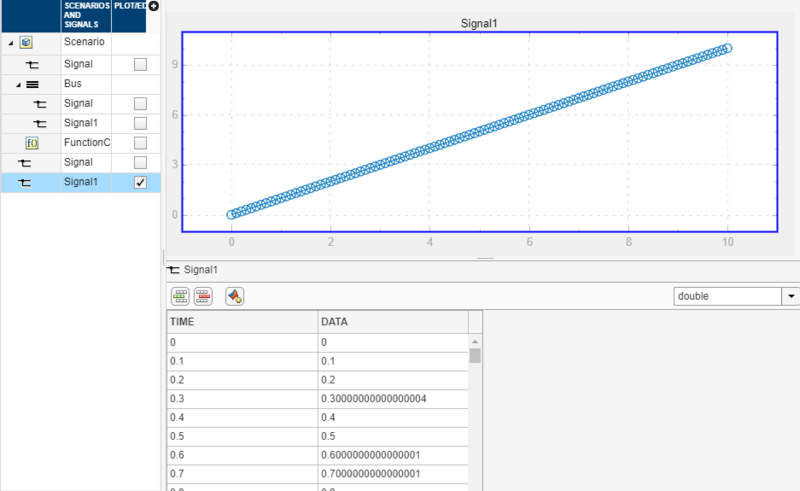 To observe the drawn signal data In Signal Editor, click the signal name in the hierarchy. For an example of how to add a freehand ramp signal, see Draw a Ramp Using Snap to Grid for Accuracy. In the Scenarios and Signals section, you can change signal names and hierarchy order, create duplicates of signals, and delete signals. 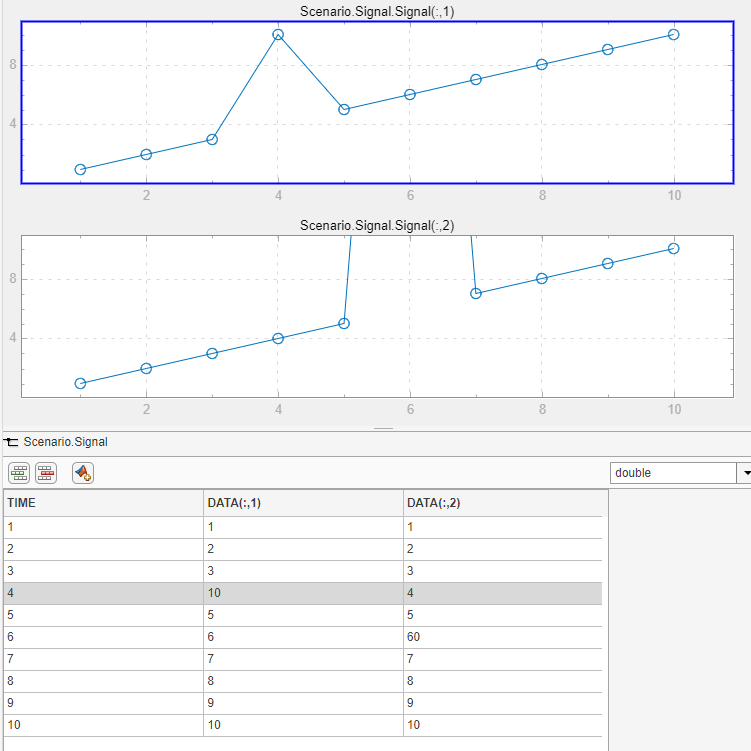 Simulink ignores leading and trailing spaces in signal names. To change a signal name, double-click the name and change it. 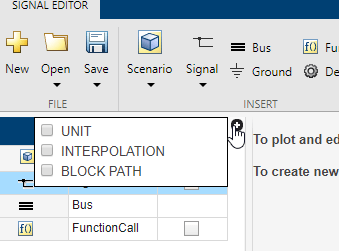 To change the unit or interpolation of a signal, click the plus sign and click the Unit or Interpolation check boxes. The pane updates with Unit and Interpolation columns. In the Unit column, enter an appropriate unit expression. For a suggested list of unit expressions, see allowed units. In the Interpolation column, from the drop-down list, select linear or zero order hold. Interpolation affects only the plotting of signals in the Signal Editor user interface. To change the order of a signal in the hierarchy, drag and drop it. For example, you can drag and drop signals into a bus. Alternatively, use the Move Up and Move Down buttons in the Adjust section. To copy a signal and paste it under the original, right-click it and select Duplicate Signal. Alternatively, use the Duplicate button in the Adjust section. You can also adjust the default properties of the signal you duplicate. For more information, see Create Signals with the Same Properties. To copy a signal and paste it elsewhere in hierarchy, select Copy and then Paste. To create signals of the same predefined type, use the Duplicate button in the Adjust section. To change the predefined signal type, click the Defaults icon, . A Default Properties for Insertion dialog box displays. Data type — From the drop-down list, select the signal data type. Enumeration — When you select the Enum data type, this parameter displays. Enter the class name of your enumeration. The Signal Editor treats the first enumeration value (Red (118)) as the canonical value and equates all subsequent instances of the same underlying integer 118 to the enumerated name Red. In other words, Pink equals Red. Interpolation — From the drop-down list, select linear or zero order hold. Unit — Enter an appropriate unit expression. For a suggested list of unit expressions, see Allowed Units. Dimensions — Enter the number of dimensions for the signal. Signal type — From the drop-down list, select real or complex. Bus object — From the drop-down list, select the bus object for which to define the dimensions. 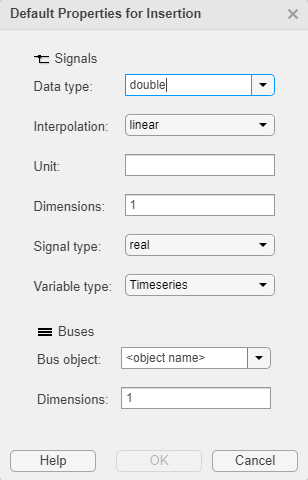 If you leave the Bus object parameter at the default <object name>, Signal Editor adds empty buses. Dimensions — Enter the number of dimensions for the bus object. 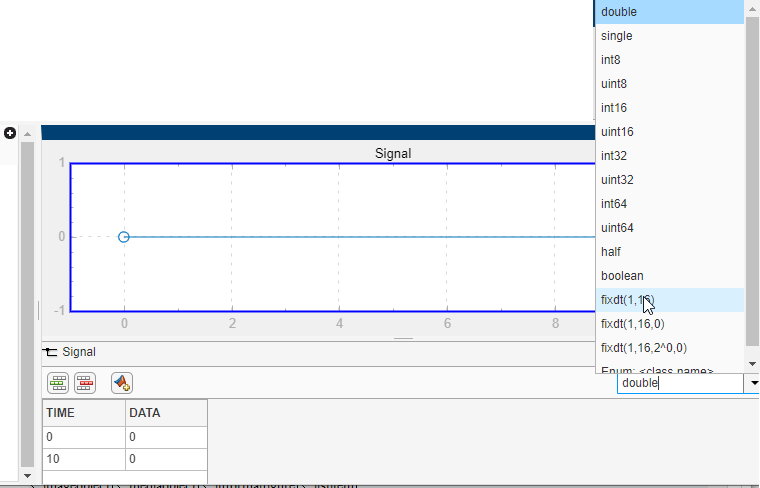 You can replace signal data using MATLAB expressions at any time, regardless of how you created the original signal data. 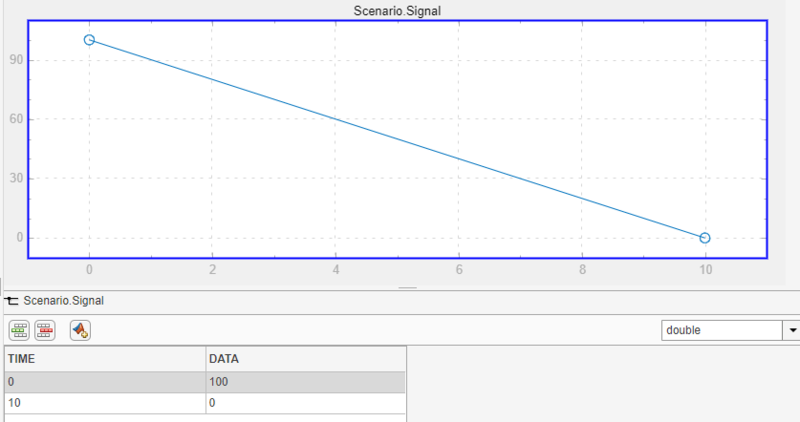 To replace signal data, select that signal in the Scenarios and Signals section, and then click the replace button ( ). Use the Author and Replace Signal Data dialog box as if you were inserting a new expression with the Author and Insert dialog box. For more information, see Create Signals with MATLAB Expressions and Variables. When replacing a signal, the signal dimension and complexity of the new signal must be the same as the signal being replaced. Change the Dimensions property in the Default Properties for Insertion dialog box, and then use Insert > Blank Signal to insert a new signal. Enter multidimensional signal data in the Author and Insert dialog box Data parameter, such as [(1:10)' (1:10)']. When you click the Plot/Edit check box for the signal, the tabular area displays the signal with columns for each dimension. 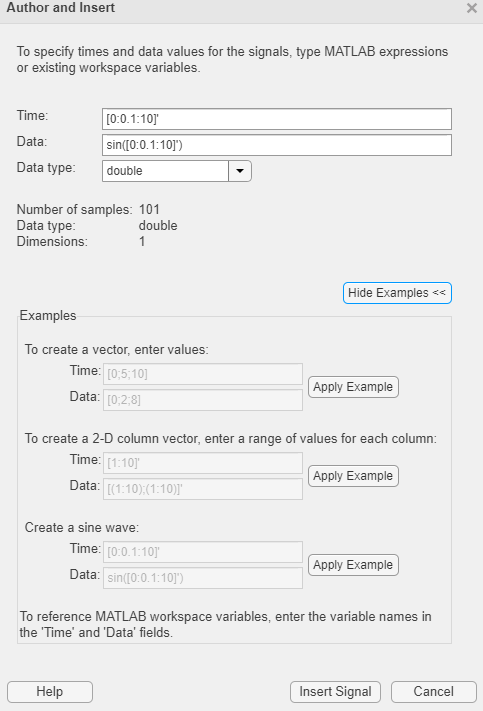 You can edit the data individually in the tabular area, or click the replace button to replace the signal with a MATLAB expression. Use the Author and Replace Signal Data dialog box as though you are inserting a new expression with the Author and Insert dialog box. For more information, see Create Signals with MATLAB Expressions and Variables. In the Signal Editor, select Signal > Author Signal. The hierarchy updates with the new signal data. Expand the new signal and click the Plot/Edit check boxes for the new signal data. Observe the associated plots and the tabular data for the signal. You can edit the data directly in the table. Or you can replace data completely with a new expression by clicking the Replace button and entering a new time range and data in the Author and Replace Signal Data dialog box. This example describes how to create a scenario to be linked to from the Root Inport Mapper tool. You can then start the Signal Editor to manipulate and add signals to this scenario. Set the gain for the Gain blocks to 5, 10, and 15, respectively. Click one of the Inport blocks, then click the Connect Input button. The Root Inport Mapper tool displays. In Root Inport Mapper Link section, select From Workspace. In the From Workspace window, enter a name to store the MAT-file, then click OK. In the Scenario section of the Signal Editor, click Signals > Edit MAT-File. In the Edit Signal File window, select the new MAT-file and click OK.
Add a signal, Signal, to the scenario. Right-click the scenario and select Insert > Blank Signal. This action adds Signal with these default properties. Alternatively, insert signals by clicking a signal type from the Insert section or using the Signal split button to author a signal using signal notations. Change the default properties of signals you want to add. In the Insert section, select Defaults. In the Default Properties for Insertion dialog box, change the data type to boolean, then right-click the scenario and select Insert > Blank Signal. This action adds Signal1 with the data type boolean. To check that the data type is boolean, click the plot check box for Signal1. This example describes how to add and delete data to the signals in the linked scenario. To create a model and data to work with, see Add Signals to Scenarios. In the Signal Editor, in the Scenarios and Signals section, click the plot check box for the signal ts. Add some data to the signal ts. Click the add row icon and add some signals. To add a signal row between other signals, click the signal before and click the add row icon. When done, click Apply. Clicking Apply updates the plot. Remove the time 20 line from the signal. Select 20 and click . Alternatively, if you want to replace all the signal data for ts with a signal defined with signal notations, click the replace button and use the Author and Replace Signal Data dialog box to define new data. This example describes how to create a ramp signal by selecting some points in the canvas. In Signal Editor, select Signal > Draw Signal. To line up the signal data values along horizontal and vertical lines, select Snap X to Grid and Snap Y to Grid. In the Signal Properties section, in Name, change the signal name to Ramp and press Enter. To add the signal to the Signal Editor, in the Insert section, click . To return to the main Signal Editor window and check that the signal has been added, click . 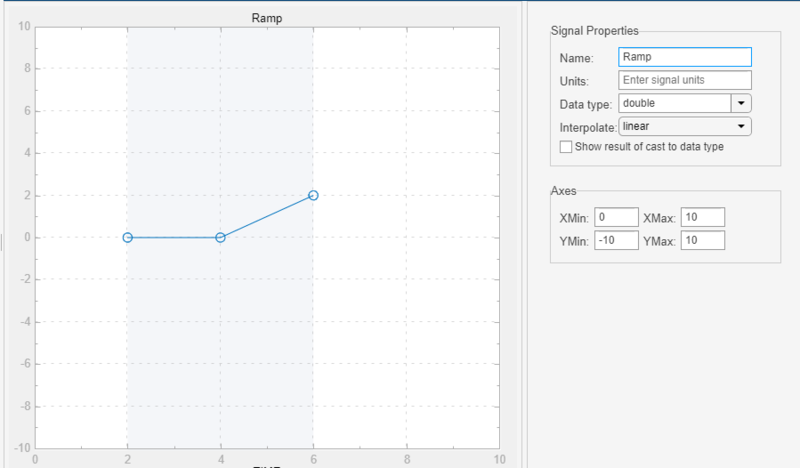 To observe the drawn signal data In Signal Editor, click the Plot/Edit check box for the Ramp signal name in the hierarchy. If the Root Inport Mapper tool has the scenario loaded, the Root Inport Mapper tool updates with the new data. If the Root Inport Mapper tool has the scenarios mapped and your changes affect the mapping, the Root Inport Mapper tool unmaps the scenario.